Seven rounds played so far in this tournament and quite a few upsets seen along the way. In joint first at the moment are Thanh Trang Hoang and Valentina Gunina ( of Hungary and Russia respectively ) who have 6 points apiece. The next 20 players are separated by only 1 point and include 9 of the top 10 initial seeds, so I guess that means that we are probably in for an interesting finish. 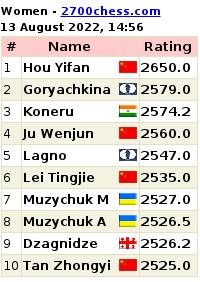 Similarly, Alexandra Kosteniuk, Kateryna Lagno, Nana Dzagnidze and Viktorija Cmilyte are GMs sitting just off the pace, with Pia Cramling ( a long-standing Swedish GM and former European Individual winner) tucked in behind them on 4,5 points. Lisa Schut ( of the Netherlands ) is placed 21st, at this point, a good achievement so far. All her points are from wins, and watching the games lives its great to see a strong fighting spirit and determination, especially in the last two games, when facing strong opposition. The European Women's Individual Championship started on Tuesday, with a few surprises in the first round, including the top seed ( Anna Muzychuk ) being held to a draw despite a 350 ELO difference ( 2594 vs 2241 ). Number two seed ( Nana Dzagnidze of Georgia ) topped that by losing to Mihaela Sandu with White ! Most of the other higher-rated games ran to form. The new Dutch Women's Champion, Lisa Schut, won, as expected, in a fairly straightforward manner, playing White in a French Defence ( Rubenstein ) against a much-lower opponent. Admittedly , its only the free "Metro" newspapers for commuters, which could make it more surprising, but still it makes a pleasant change to read an encouraging chess article on the way to work ! The cause of this front page is a new Dutch Champion. No, not GM Dimitri Reinderman ( the "Dutch National" Champion ) but rather the Women's Champion, Lisa Schut. "How did you start playing?" ( My parents taught me and my sister : it was a great family experience ). "Did you expect to win this Championship ?" (No, it was a total surprise. In the tournament, I felt no pressure, enjoyed my evening relaxing and eating out, and played with an open mind ). "What's it like as a young woman in the chess world ?" There are also obligatory mentions of her coaches ( Vladimr Chuchelov, the Belgian/Russian, and an occasional Adrian Mikhalchisin. ) plus a diversion to her participation in the forthcoming European Women's Championship,, which starts on Monday. In this forthcoming tournament, she says she is hoping to surprise, although facing the likes of Anna Muzychuk, Antoaneta Stefanova, Pia Cramling, Tatiana Kosintseva, Kateryna Lagno etc I think she will have to pull out more than just a rabbit from her hat ! She's now a WIM and rated 2277, so about the middle entrant in a field of 150 participants, but you never know. If she continues her confident winning streak she could well end up with a great result, maybe in the last 16, as she is hoping. Yesterday was, just as today is, a beautiful sunny day, and definitely not one to be used up inside the house. Luckily for me, whilst out doing the usual Saturday tasks, and enjoying them much more in the sun, I wandered through the chess centre of Amsterdam to discover a "Chess Festival" in full swing. 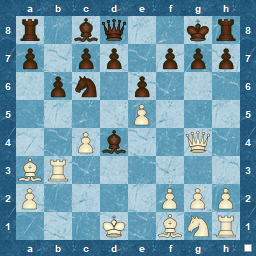 As well as a Kid's Corner, Mate in two problems to win prizes and the Dutch under 20 championship, there were also simuls by GMs Loek van Wely and Daniel Stellwagen , and blitz against IM Manuel Bosboom. Just shows that chess isn't always quite so serious as people think, and you can still have fun, or perhaps better, enjoyable activities around it. Afterwards, I visited the Max Euwe Centre, which had sponsored the event. Surprisingly I have never been before, since it usually only opens on weekdays. A small but well-put-together exhibition about Max Euwe's chess career, including intriguing and in some sections amusing DVD footage, I guess from just before his 1935 Match against Alekhine for the World Championship, when Capablanca is asked to comment on Euwe's style of play and chances against Alekhine. Great fun, and strange to see footage of such famous players : I never knew such things existed ! It also contains a library, available for consultation ( not lending ) by the public, and during my visit, a few people were also watching the live transmission of the current Dutch Championship, which is being played out this week. UPDATE: Here's the official report !